Images from the third One-Day International between India and West Indies, in Pune, on Saturday. 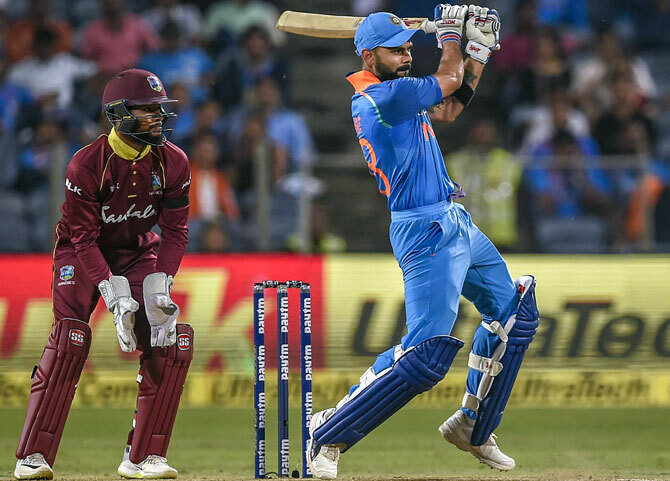 Captain Virat Kohli continued his record-breaking run with the bat but the rest of the Indian batsmen failed to live up to expectations as West Indies levelled the five match series 1-1 with a 43-run victory, in the third ODI in Pune, on Saturday. Kohli became the first Indian and 10th overall to score three successive hundreds in ODIs as he stroked 107 but India were sent packing for 240 in 47.4 overs in reply to West Indies' 283 for nine. 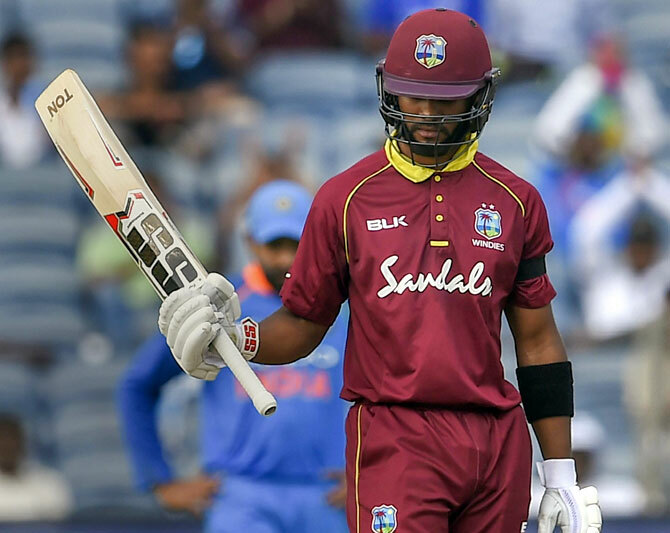 Part-time Marlon Samuels ended India's hopes with the wicket of India skipper Kohli as he finished with three for 12, while Jason Holder, Ashley Nurse and Obed McCoy took two wickets apiece. India had won the lung-opener in Guwahati before the second match finished in a thrilling tie in Visakhapatnam. A determined Kohli notched up his 38th ODI hundred and seventh against the Windies. He hit 10 boundaries and a lone six in his 119-ball knock at the MCA International Stadium. India had their chances till Kohli was at the crease but West Indies skipper Jason Holder's gamble to bring in part-time off-spinner Samuels paid off, as he got the prized wicket of Kohli in the 42nd over and that changed the complexion of the game. Kohli tried to pull a quicker one by Samuels, but missed it completely and was bowled. With track slowing down, it proved to be a tough job for the Indian tail-enders. In contrast, West Indies' lower-order batsmen Ashley Nurse (40) and Kemar Roach (15) produced a a crucial 56-run stand for the ninth wicket. Kohli, who walked in early after the fall of Rohit Sharma (8), took down to settle. 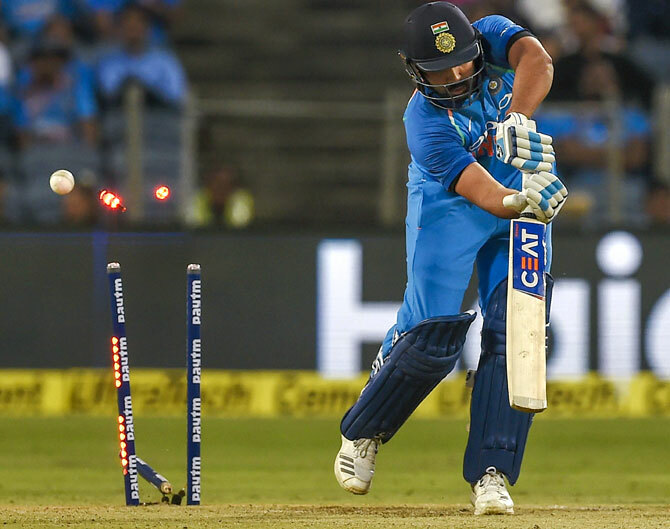 Looking stable as ever, the India captain notched up his fifty with a pull shot and eventually reached the three-figure mark with a single down to fine leg off 110 balls. Shikhar Dhawan (35), Ambati Rayadu (22) and Rishabh Pant (24) got off to starts but failed to convert them as the Windies bowlers stuck at regular intervals. A lot was expected from the experienced Mahendra Singh Dhoni, who was dropped for the West Indies and Australia T20 series, but he continued his poor run with the bat as he was caught behind off Holder for seven. 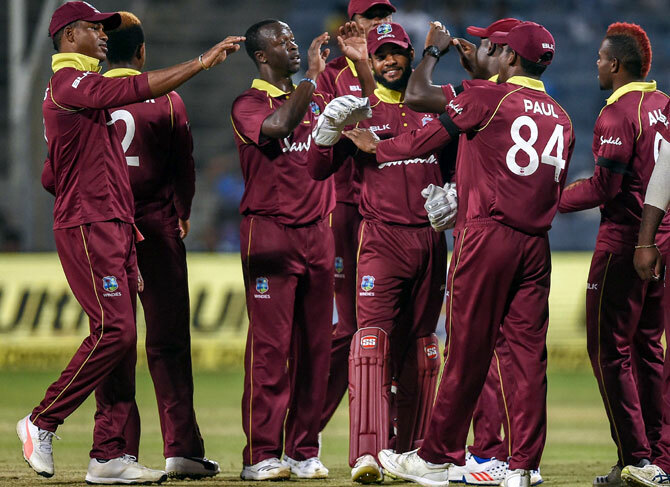 Earlier, pacer Jasprit Bumrah denied Shai Hope a second-consecutive century on his way to a four-wicket haul but the West Indies made a superb recovery after a shaky start to post a respectable 283 for nine. Returning to the team after being rested for the first two matches, Bumrah emerged the most effective bowler, conceding just 35 in his 10 overs. Bumrah sent both the Windies openers -- Kieran Powell (21) and Chanderpaul Hemraj (15) -- in his first spell to give India a solid start and later dismissed Hope and Ashley Nurse (40). Hope, who had struck an unbeaten 123 in the Visakhapatnam ODI, played a significant role in reviving the Caribbean innings with his 95-run knock, which came off 113 balls. Towards the end, Nurse and Kemar Roach (15 not out) added crucial 56 runs for the ninth wicket, taking the side past the 275-run mark. The West Indies batsmen got starts but could not convert them into big knocks and also struggled to form big partnerships. Hope, though, dug in from one end, raising a 56-run stand with Shimron Hetmyer (37) for the fourth wicket. The credit to break that partnership goes to former captain Mahendra Singh Dhoni's brilliant glove work as he took the bails off with lightening speed when Hetmyer was marginally outside the crease, trying to launch Kuldeep Yadav, who picked up two for 52. Before that stumping, Dhoni had taken a breathtaking catch to remove Kieran Powell, racing towards the fine leg region, before diving full length to take a stunning catch off a top-edge off Bumrah. It was a sort of statement by the charismatic Dhoni, who was left out of India's Twenty20 squad on Friday. Hope also combined with skipper Jason Holder (32) for a 76-run stand for the sixth wicket. Continuing with his good form and combative attitude, Hope handled the middle overs with elan. He was severe against Yuzvendra Chahal, whom he hit for sixes with ease never letting the bowler dominate. However, Bumrah denied him the milestone mark by bowling the right-hander with a well-executed yorker. Hope's knock was studded with six fours and three sixes. The innings looked like falling apart again but Nurse and Roach contributed 55 runs for the ninth wicket to ensure the visitors finish with a fighting total. Is this the beginning of the end of Dhoni's career?